News and opinion on our controversial owners. Love United, hate Glazer (LUHG). Even at the age of 70 Sir Alex Ferguson is still thinking long-term – which is surely reason enough for Old Trafford’s power brokers to back him in this most pivotal of summers. The United manager’s pursuit of Brazilian starlet Lucas Moura is not a signing for the here and now – just as Nick Powell’s peak years will come long after Ferguson has retired. At 19 and with no experience of playing outside of his homeland, Moura is part of Ferguson’s succession plan. His obsession with ensuring the dynasty he has built over more than two decades at Old Trafford continues to reap rewards long after his departure. Robin van Persie is a different matter altogether. The 28-year-old Dutchman – soon to be 29 – is pure indulgence on the part of Ferguson. A player who will have little or no sell-on value, who will stretch the club’s wage structure to the limit as well as breaking United’s self-imposed policy of signing emerging talent before they reach their peak years. Van Persie would provide a Fantasy Football partnership with Wayne Rooney, which could come at the expense of one of the club’s most talented prospects in Danny Welbeck, whose opportunities would be impacted, as well as Javier Hernandez. From a strictly business point of view, a fee of around £20 million and wages nearing £200,000-a-week for a player of his age would not make a lot of sense to United’s money men. But if anybody deserves to be indulged, is it not Ferguson? Turning 71 at the end of the year there is speculation that this season could be his last. 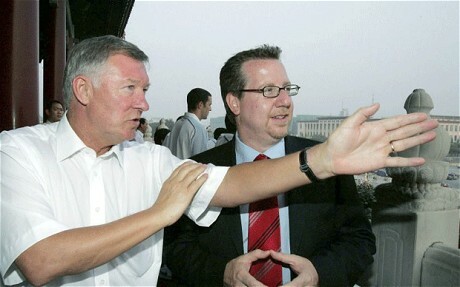 But even if it isn’t, Ferguson himself has admitted he needs to slow down and that he is approaching the end of his career. Having succeeded in his pledge to knock Liverpool off their perch by leading United to a 19th title, he had to endure the unthinkable last season when seeing United toppled by noisy neighbours City. And even after such a trophy-laden reign at Old Trafford, any retirement would surely be soured if his final years were spent looking up at Roberto Mancini’s side. That would only be exacerbated by the knowledge that he had to take on the last great challenge of his career with one arm tied behind his back by those who control the purse strings above him. That United managed to push last season’s Premier League title race to the final seconds took every ounce of Ferguson’s managerial expertise. He was able to wring every last drop out of his squad to miss out on goal difference alone. And privately even he would accept that it would be too much to expect a repeat – especially against a City squad emboldened by success. That is why he has spent the summer identifying the players to challenge Mancini’s champions and the expected resurgence of Chelsea. Midfield and attack are clearly the areas of most concern to Ferguson. Signing Japanese playmaker Shinji Kagawa and midfielder Powell, he tried and failed to lure Eden Hazard, while Tottenham’s valuation of Luka Modric priced him out of a move for a player he has coveted for some time. He has since turned his attentions to Moura – one of Brazil’s latest sensations and currently in the UK for the Olympics. But with negotiations with Sao Paulo at an impasse, with United so far refusing to up a final bid of around £29m, Ferguson faces the familiar prospect of being disappointed in the transfer market. He’s watched Karim Benzema, David Villa, Samir Nasri, Wesley Sneijder and Hazard slip through his fingers in recent years – so has every right to put the pressure on United’s money men to stump up the cash now. Taking the unusual step of admitting interest in both Moura and Van Persie in recent weeks, he sent out a clear message to United supporters that any perceived lack of ambition in the transfer market does not extend to him. He has put the ball firmly in chief executive David Gill’s court to make the deals happen. This is a vital week in the case of Moura, whose complicated contract means he can demand 30 percent of any transfer fee as of August 1. The player is currently entitled to 20 percent, meaning it is in Sao Paulo’s interest to push through a deal before the end of the month, otherwise having to increase his asking price to make up the shortfall. United also have the chance to steal a march on City in the chase for Van Persie after Juventus appeared to withdraw their interest. The rising tension between Mancini and football director Brian Marwood will not have gone unnoticed at Old Trafford. While Mancini wants to wrap up a deal for his number one target, Marwood is obliged to try to balance the books. He has lengthy list of expensive misfits who need to be sold in light of UEFA’s financial fair play regulations. Emmanuel Adebayor, Roque Santa Cruz and Wayne Bridge become more problematic the longer they remain at the Etihad Stadium. Mancini’s thoughts are of strengthening his champions with more world class arrivals. He was as disappointed as Ferguson when Hazard opted for a move to Chelsea – and he will be furious if he misses out on Van Persie too. The all-Manchester battle for Arsenal’s want-away striker will serve as a perfect appetiser before both sides go head-to-head for the title again next season. It would serve as a psychological boost to whoever wins his signature. For Mancini it would be further confirmation of the growing power he craves at City. But for Ferguson it would be a sign that United are prepared to loosen the straightjacket to give him a fighting chance of ensuring his final years in management are spent leading the pack, rather than chasing it.